Classic 80s Atari arcade game Paperboy is to get a spiritual (albeit commercially unrelated) successor in the form of a new Oculus Touch and HTC Vive title Special Delivery from developers Meerkat Gaming. Here’s what it looks like in action. 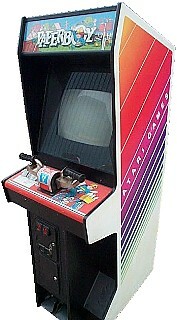 An original Paperboy arcade cab, complete with handlebars. A stalwart of the 80s gaming scene, Paperboy will be fondly remembered those old enough to have frequented the murky world of arcades back in the day. Developed by Atari, Paperboy was an isometric action game which had you play as the titular hero, frantically delivering his payload to customers through an a series of ever more hostile and precarious environments. It was fun, funny and actually pretty tricky to master. It was a huge hit, even featuring a saddle and BMX handlebars on the larger arcade cabinets. Warp to the future (that’s where we’re living folks) and virtual reality is now promising to push and perhaps redefine the boundaries of traditional gaming. It’s somewhat interesting (if perhaps entirely expected) then that developers are turning to the past for inspiration of what to build in VR. Rebellion recently demonstrated just how well a retro game can be updated and refactored to become compelling (Atari too as it happens) VR gaming prospect and now developer Meerkat Gaming is doing the same with a title which is heavily inspired by Paperboy, called Special Delivery – revealed recently via the company’s twitter feed. You can see the game in motion in a trailer for the title (at the top of this page) and it’s shaping up nicely. From what we can ascertain, motion controls are used to control both hands which can independently steady and steer the handlebars or lob papers from the bike’s basket at roadside targets. It’ll be interesting to see how motion sick prone people fare with the bike in motion. No word yet on a release for the title, but the developer says it is being built for both Oculus Rift (with Touch support) and HTC Vive. We’ll let you know when we hear more. 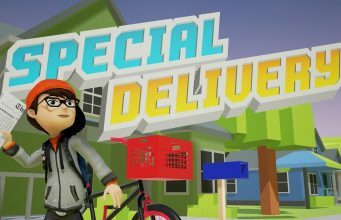 The post Watch: ‘Special Delivery’ Brings Atari Classic ‘Paperboy’ Style Action to VR appeared first on Road to VR.